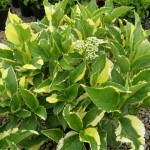 A broadly rounded shrub with a stunning blend of yellow, cream, white, and green variegated foliage. Each leaf is different. Flowers are mauve and white lacecaps. 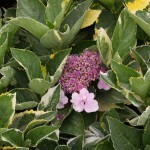 It will only bloom in mild climates. Needs moist soil and some shade.